Sonika is entering her fourth year as an undergraduate student at Northeastern University studying Behavioral Neuroscience. She is working at CNBS for her second co-op where she is assisting on various research studies. Previously, Sonika worked at MGH’s Post-Traumatic Stress Disorder Research Laboratory where she specialized in postpartum research on the assessment, pathophysiology, and prevention of PTSD. She looks forward to continue studying novel therapeutic interventions for neuropsychiatric disorders at the Berenson Allen Center. In her free time, she enjoys exploring new neighborhoods in the Greater Boston Area, eating at her favorite restaurants, and spending time with her family and two dogs. 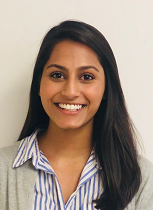 Sonika is excited to continue researching and studying neuropsychiatric disorders in hopes of one day pursuing a career that will allow her to integrate the fields of neurology and psychology.